Here you have the opportunity to embark on one of the included Off Train Excursions, taking in the delights of this famous outback town. A full day of touring in Alice Springs gives you ample opportunity to visit the town landmarks, get up close and personal with Australia's incredible flora and fauna or explore. At this point you may choose to upgrade your excursion with the ultimate outback experience; an intimate scenic fixed wing flight to Uluru, where you will enjoy lunch and take in aerial views of Uluru and Kata Tjuta. Come the evening you'll dine beneath a canopy of stars at an authentic Outback BBQ Tour. Terms and conditions apply. 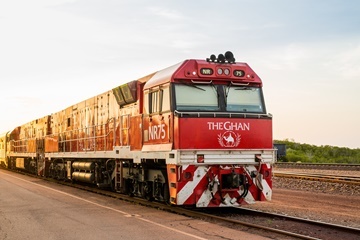 This offer is valid for travel on the Ghan Expedition only ( Darwin to Adelaide) for travel in Gold Service Superior, Twin and Single Cabins only. This offer does not apply to Platinum Service. This offer is yield managed and subject to availability at the time of booking. Valid on April departures only. Full payment is required within 14 days of booking. 100% cancellation fees apply 14 days after the booking date. The fare is non-transferable and non-refundable. No amendments allowed. Not valid with any other offer. Prices advertised are for payment with cash, credit card surcharges apply.